Born: 13 March 1872, Bathurst, New South Wales, Australia. Harry S. Denny, like his older brother George A. Denny*, is said to have studied mining engineering at the Ballarat School of Mines, University of Melbourne, from 1887 to 1890 (Men of the times...; i.e., at age 15-18!). He went to London in 1890 where he did metallurgical work for over a year. From there he proceeded to Austria where he was engaged as assistant manager in gold mining for seven months. In 1891 he went to Portugal to conduct gold ore crushing operations for a London company. Returning to London in 1892 he superintended the construction of machinery for use in South Africa. He visited the Transvaal in July that year, returning to London by the end of the year. In 1893 he went to Natal in connection with gold mining, remaining to 1895. The next year he worked at the gold mines near Klerksdorp, but in 1897 established himself in Johannesburg as a consulting engineer and partner of his brother George. After the Anglo-Boer War (1899-1902), in 1903, he became general manager of mines controlled by the General Mining and Finance Corporation. 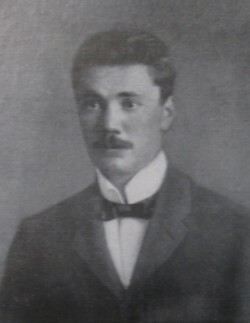 Harry Denny was a member of the Chemical and Metallurgical Society of South Africa (from 1902 the Chemical, Metallurgical and Mining Society of South Africa). In July 1903 he delivered a major paper, "Observations on the metallurgical practice on the Witwatersrand" before the society, dealing with all aspects of ore treatment. The paper received much praise and was published in the society's Journal (Vol. 4, pp. 8-43; reply to comments pp. 369-379). He became a foundation member of the South African Association for the Advancement of Science in 1902, and at its annual meeting in Johannesburg in 1904 delivered a paper on "Some economic problems in metallurgy on the Witwatersrand" (Report, 1904, pp. 109-118). He was the first to emphasize the need for fine grinding of Witwatersrand gold ore by means of tube mills. Harry was also a member of the South African Association of Engineers, the South African Institute of Mechanical Engineers, the American Institute of Mining Engineers, and the (British) Institution of Mining and Metallurgy, and was honoured as a Commander of the Order of the British Empire (CBE). By 1906 he was again living in London, but during the census of 1911 resided in Acton, Middlesex. During World War I (1914-1918) he worked as a superintendent in His Majesty's Factory Langwith, in Derbyshire, which manufactured ammonium perchlorate for the explosives industry. In 1920 he visited Canada to investigate various mineral deposits and evaluate mining prospects. After a second visit in 1923 he reported favourably on mining prospects at the Porcupine Goldfield in Ontario to British investors. In 1921 Denny was co-author, with his brother George, of a paper on "The new developments in ore treatment on the Rand", published in The Mining Journal, London. The next year he and N.V.S. Knibbs published an extensive paper, "Some observations on a producer-gas power plant" in the Proceedings of the Institution of Mechanical Engineers. He appears to be the same person as Henry Samuel Denny (born 1872) who published "Money and the world crisis" in the Bulletin of the Ontario Department of Mines (in two parts, 1933-1934, No. 80 and 93). Denny and his wife, Edith M. Denny, were married in 1900 and had a son and a daughter. Bate, Peter. Personal communication and copies of documents pertaining to H.S. Denny, 2018-4-20. Chemical, Metallurgical and Mining Society of South Africa. Journal, 1903/4, Vol. 4, paper by Denny; 1904/5, Vol. 5, Members. Google scholar. http://scholar.google.co.za Publications by H.S. Denny.